When you think about property hotspots in Eastern Europe, Prague, Warsaw or even the Baltic states may spring to mind. Few people would necessarily put the capital of Ukraine in the same category. Yet Kiev is now believed to be the most expensive city in Eastern Europe in which to buy a home. Prices increased by 10-25% in just the final two months of 2006. New blocks of flats are springing up across the capital of this former Soviet republic. One such is the Triumph apartment complex. It overlooks rolling hills and golden-domed churches on the edge of the city, and according to TMM, the company responsible, will have a swimming pool, spa and underground parking. Although months remain till the building is complete, much of it has been sold already. 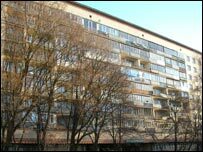 And although the flats remains a concrete shell - as with most flats in Kiev, it is up to the owners to fit floors and doors and finish the walls - a three-bedroom unit is valued at about $1m. This kind of price is estimated to be about three times what it would have been two years ago - although, with no public register, no-one is entirely sure of the exact figures. The cost of apartments has already overtaken some EU cities like Amsterdam. "It's been amazing," says Tanya Plemenyuk from NAI Pickard Commercial Real Estate Services, who is showing a prospective investor round the flat. "Kiev has experienced such a property boom. I bought a flat three years ago for $30,000, and now its worth up to $200,000." Part of the story is simply a rising demand for accommodation as wages go up and the economy grows - a demand for which supply cannot keep up. "People simply want to move out of their old Soviet style housing, and move into something more comfortable," says Jaroslav Kinach from property developers XXI Century Investments. In addition, many Ukrainians don't trust banks, preferring property as a way of securing their savings. And then there is also a new class of super-rich Ukrainians looking for ways to invest their money: a tiny, but incredibly wealthy, group of business people who have done well since the collapse of the USSR, often in traditional industries such as steel production. But the main driver for the property boom is speculation. 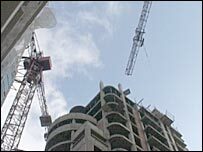 Investors tend to snap up new flats, then leave them unfinished and empty - adding to the imbalance between supply and demand. At the offices of agents Parker and Obolensky, prices start at $500,000. "In my experience the most expensive places cost $25,000 per square metre," says Parker and Obolensky's Ruslan Suchkoe. "That's not a joke. Apartments of this price are about 100 to 300 square meters in size." Such a valuation would put the top of the market at around $7.5m. But despite the building frenzy, Ukraine remains one of the poorest countries in Europe. The cheapest one-bedroom flat in Kiev costs in the region of $100,000- far beyond the reach of most people in a city where the average salary is about $200 a month. At the age of 30, Tanya Voroshko still lives with her mother. For her, buying her own home seems like an impossible dream. "It makes me feel hopeless and helpless," she says. "No matter how hard you try, taking into account I make pretty good money, still I can't afford it. "It makes me feel angry and like there is no place for young professionals like me in this city." Even as darkness falls across the capital, the building work continues. Some building sites operate 24 hours a day. But with so much speculation, and such an imbalance between prices and salaries, many fear that the residential property market in Kiev is in danger of overheating. It could be a bubble - and if so, there is no way of knowing when it might burst.